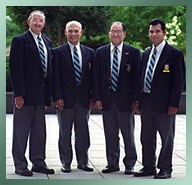 On June 17 2004 the Pan American Health Organization recognized IBS guards for their "Outstanding Service" to the organization. "The recognition was because of the dedicated and exceptional service they have provided in the area of safety and security for our Headquarters staff." "The main criteria for this award includes demonstrated commitment and contribution towards the Organization and observable teamwork, dedication to duty and espirt de corps. These qualities are clearly exhibited by the team of guards whose loyalty, vigilance and reassuring presence, especially during these times of increased security threats, have resulted in no personal injury or damage to the PAHO employees or Headquarters building during their service." 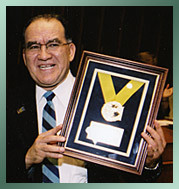 Above is Teodoro Sejas with his award; Teodoro has worked for IBS for over 25 years. Below is Peter, Harold, Teodoro Sejas, and Sergio. Thees are just a few of the guards who have distinguished themselves working for IBS and are the heart of are organization. At IBS we are proud to have such individuals represent the company, and just as proud that many of our employees have remained with us for many years. And we know it is more than a cliche that the whole is more then the sum of its parts.